Surprise! It's a Sears Cape Cod! Yes, this is a Sears house, remodeled so much it is unrecognizable today. I was contacted by a reader, Larry Johnston, who said his grandparents built a Sears Cape Cod model in south Arlington Heights. His mother, Mary Lou Marx, sent me these historic photos of the same house shown above. Let's compare those to the catalog picture. The Sears Cape Cod with shutters. Note the cornices on the roof. 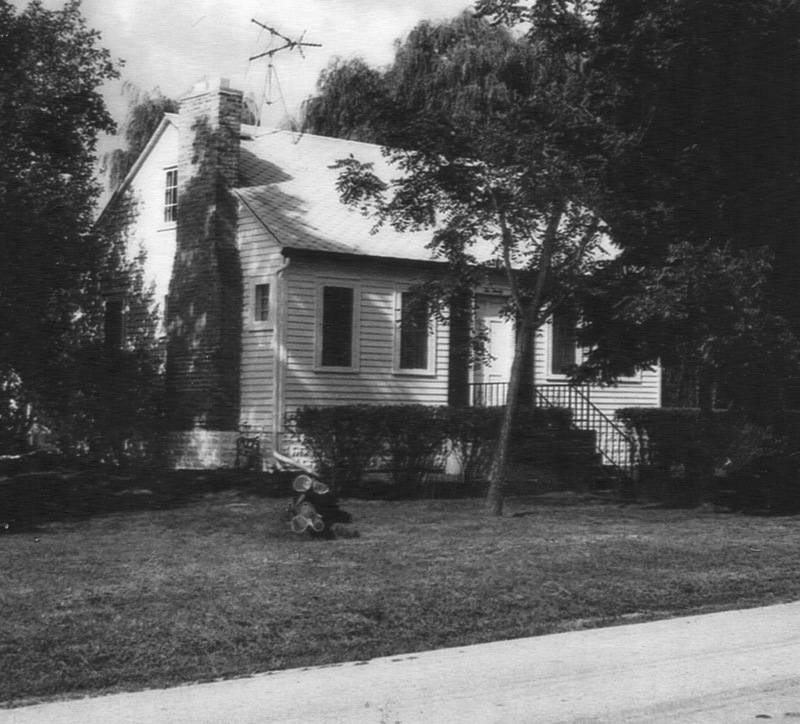 The Marx house in 1946. That's eight-year-old Mary Lou Marx in front. There were no front steps yet! The extra chimney was because the house originally had a coal-fired isinglass base burner in the living room rather than central heat. 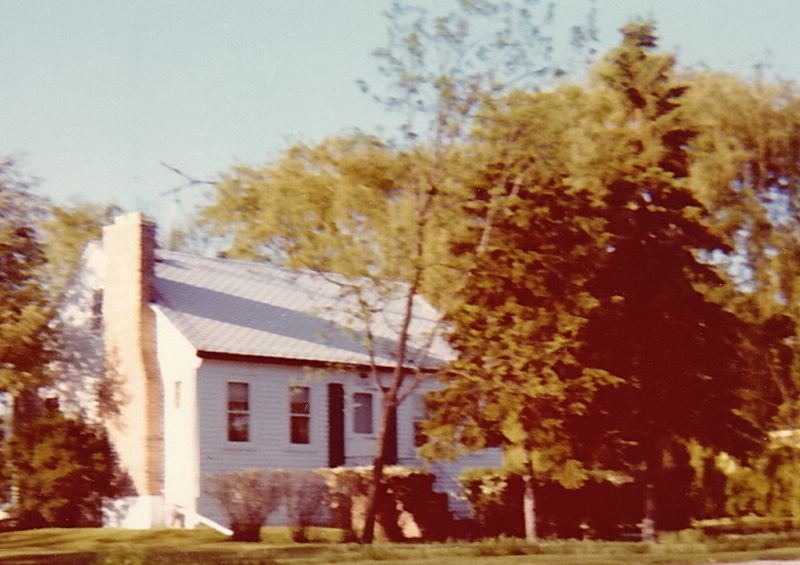 The Marx house in 1974. The cement front porch is the same today. This Sears Cape Cod was built in 1937. In 1937 the neighborhood was not officially part of Arlington Heights (it was in Elk Grove Township). 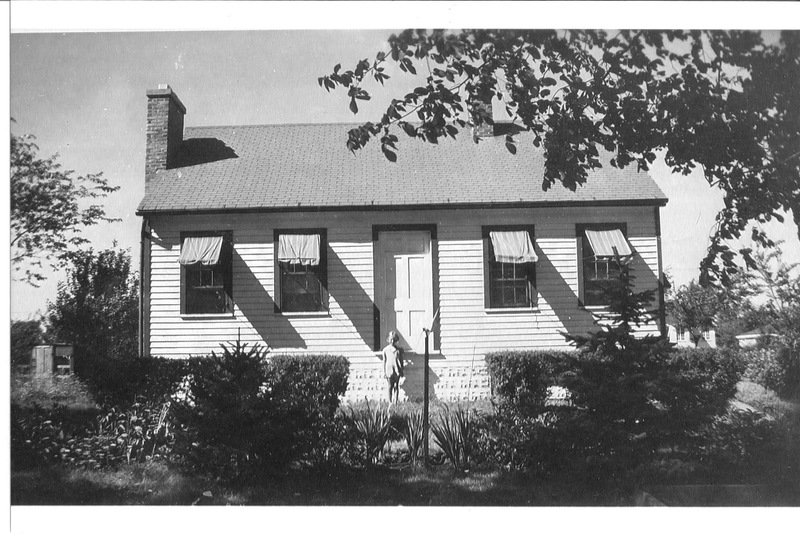 The Marx's house was originally white with green trim and green-striped canvas awnings. The Cape Cod was small four-room house--30 feet wide and 22 feet deep. "Crisp neat lines, almost brisk in their simplicity, glow proudly with New England tradition," reads the description in the Modern Homes catalog. The Cape Cod came in two different floor plans. This house was the smaller model with the side door. Photo from 1974 shows the side door. 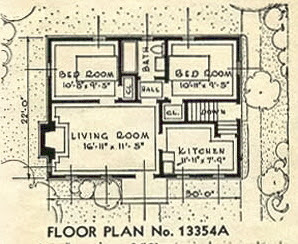 When originally built, the Marx house had stairs to the attic on the living room side (where the plans show a closet). In the 1970's the attic stairs were moved above the basement stairs and the attic was finished as a single large bedroom. The first owners were Benjamin and Lillian Belle Marx. Benjamin, his brother, and their friends built the house themselves. They spent about $4000 on the Cape Cod. Benjamin was a tool and die maker. In 1940 he worked at the Buick Aviation Engine Plant in Melrose Park. 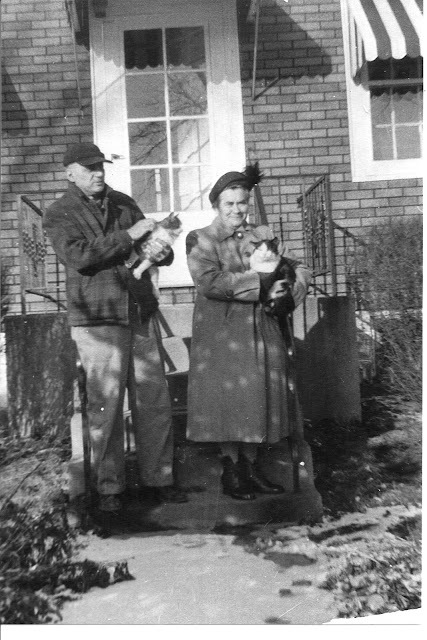 Benjamin and Lillian Marx (and Fluffy and Rowdy) in front of the house about 1950. 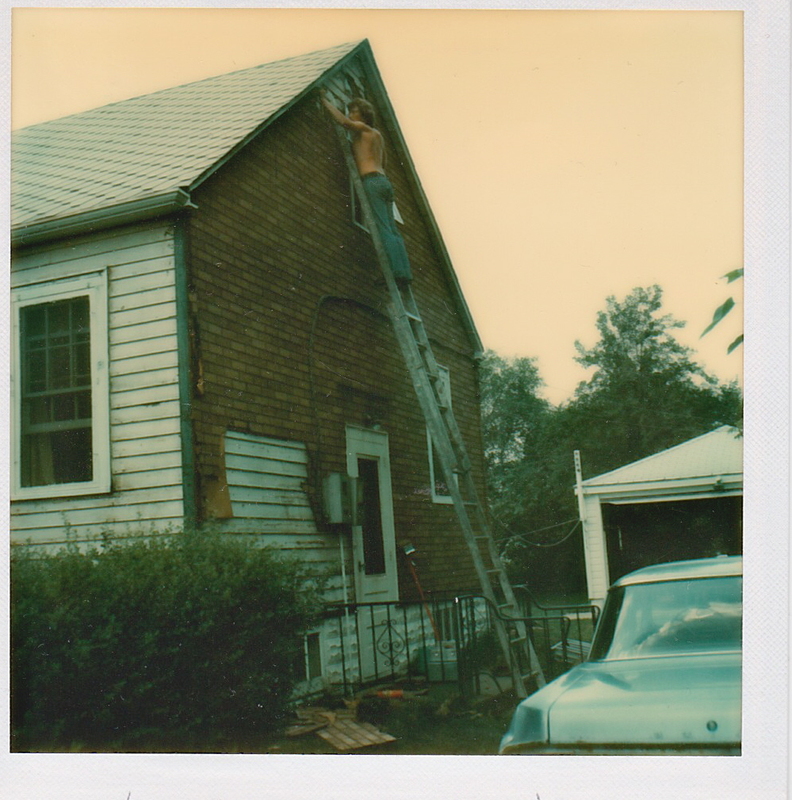 The composite "brick" siding (later removed) was added about that time to help insulate the house. The Marxes raised their daughter, Mary Lou, in the house. 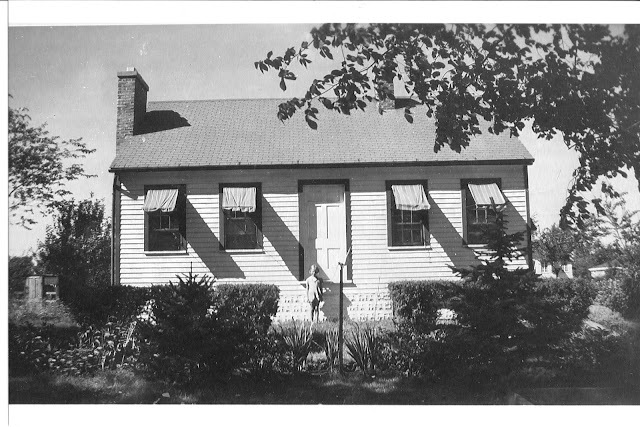 The area was so rural, she walked a mile every day to a one-room schoolhouse on Arlington Heights Road--in the 1940's! Mary Lou remembers her mother cooking oatmeal for breakfast on the base burner stove. During World War II, the family raised chickens for eggs and had a victory garden in the yard for tomatoes, carrots, peas, and beans. Benjamin died in 1960 and Lillian died in 1975. The house was on a big parcel of land, but shortly after Lillian's death the house was sold and the property was subdivided into three lots (the two houses to the west were later built). The second story addition and the square footage added to the east side of the house were done in 1996. There still exist some features that hint at the original design. "It was DEFINITELY a Sears house. When we remodeled it in the early 70's, I remember specifically all the markings on the studs and joists. 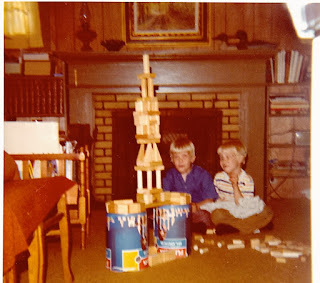 It was a 100% Sears house, including the original well pump was a Craftsman (if memory serves, it worked up until 1974). My Grandfather was a big Sears customer! "[The interior] had never been completely finished; I was the one in charge of digging through the bundles of unused baseboard trim, deciphering the faded stencils to determine which room they belonged in. I remember there was a 'decoding' list, it was old and faded even then, but clearly was labeled 'Sears.' We pulled off the Celotex wallboard, rewired to current code, reinstalled the wallboard and then paneled (yuck!) over that. Each stud had a stencil on it! I also remember the windows were original at that time; they were double hung with sash weights hung by rope over a pulley; when we opened up the walls I thought it was really cool the old weights were labeled 'Sears'." The Marx house about 1975. According to Larry Johnston, one of the spruce trees in the front yard was donated to Arlington Heights in the 1970's for the village's annual Christmas tree. Both Mary Lou and Larry have fond memories about how comfortable and cozy the house was. Larry's younger brothers, R. Paul and David Vollmann, playing in the living room about 1975. 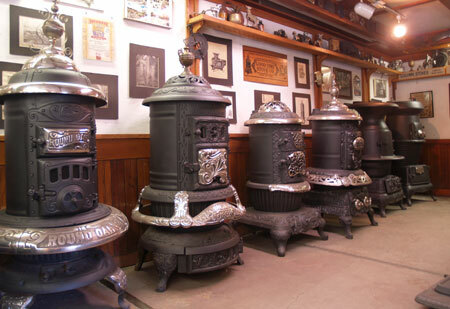 "The gear driven fireplace damper (it was also a Sears--I remember helping to fix it once) was a luxury touch that still isn't very common today," Larry wrote. These post-1934 Sears Homes (after the FIRST closure of Sears Modern Homes in 1934) are just scarce as hen's teeth. So just finding an authenticated post-1934 Sears House is a real coup. Secondly, I've never seen "Sears" stamped on any window weights, nor have I ever heard of it. I'd love to see a photo of THAT! Perhaps it's something they just did in the very last years. And I love the stories of finishing up the house SO many years after it was started. I bet that such stories are NOT that uncommon. After all, 12,000-piece kits can take a LOT of time!